These are seriously some really crazy discounts. Black Friday and Cyber Monday only happen once a year in late November, and these days are usually the best deals of the year as well. Make sure to find your deal and grab it! Black Friday and Cyber Monday are right around the corner, and this is the best opportunity to splurge. VPN services tend to offer huge discounts for long-term contracts already. Can they possibly offer even better savings during Black Friday and Cyber Monday? We’ve researched the latest offers and bring you the best of the best deals in the industry. Be sure to take advantage of the huge lumps of discounts, coupons, and offers from VPN services listed below. If you’re looking for promotions outside of the cyber month, take a look at our VPN coupons and discount codes page. Ivacy VPN offers one of the cheapest VPN services in the industry. Not only that, but they also offer a decent speed, great security, unthrottled torrenting, and bypasses Netflix restrictions. But just when you thought that Ivacy couldn’t be any cheaper, Black Friday comes and proves you wrong. Get 1 year free when buying a 2-year plan ($54 for three years, or $2.25 per month at 77% savings). Get a 1-year plan at $3.33 per month for a total savings of 66% ($40 for 1 year). Get a 5-year plan with 87% discount – $80 total, or just $1.34 per month on average. That is effortlessly one of the least expensive VPNs available. Without protection as the main priority… simply dependent on value, servers, and Netflix accessibility, this is an astonishing arrangement. Let us also remind you that Ivacy is also ranked in our top 10 VPN list. Click here to get the Ivacy VPN Black Friday Coupon. ibVPN is ranked #8 in our top VPNs list, and is definitely a top contender for a “best promos” award with these kinds of regular discounts around the holidays. Their Ultimate VPN plan goes for $58.06 per year, or $4.83 per month on average. During the promotional dates, this plan will go on sale for $41.47 per year. This saves you nearly 30% from their top tier plan which provides all your browsing, torrenting, streaming an security needs. Their other plans are also on sale, Standard VPN plan goes for $18.47 per year and Torrent VPN for the same price – averaging only $1.53 per month. Click here on November 23 to get the ibVPN Coupon. IPVanish is offering a sale for new customers only. What’s cool about IPVanish’s promotion is they’re celebrating the entire week – covering Black Friday and Cyber Monday. We’ve already mentioned in our review that their prices are not expensive to begin with. With this deal, you can get 72% off of their longterm plan; IPVanish has created an entirely new package for this week – a 2-year plan for $79.99, or $3.33 per month on average. Trust.Zone is the one you can trust… to have a nice Black Friday VPN deal! They are offering a 2-year subscription for a total of $55.95. That comes out to just $2.33 per month on average. Holy savings! On top of that, if you order with cryptocurrencies, you get an additional 10% off. Not only does that help protect your anonymity but it saves you money as well. The grand total is $50.35, or just $2.01 per month. Two dollars per month for a VPN that does everything (Netflix, torrenting, kill switch, etc). There’s no reason to not get this deal. SaferVPN, just like PureVPN, is an upcoming player in the VPN market. It offers great features like 256-bit encryption, strictly no-log policy, IP and DNS Leak Protection and much more. This Black Friday deal is a promising start for SaferVPN. They normally offer three membership plans: $10.99 every month, $65.88 every year, and a $78.96 for two years. In the event that you decide on their $65.88 1-year plan, it shakes out to around $5.49 every month. Their $78.96 per two-year plan hits a low of $3.29 every month. However, Black Friday saves the day with some bigger discounts than the normal amounts. Their 1-year plan is refreshed at $59.88, or $4.99 per month on average. The 2-year plan stands at $71.77, or $2.99 per month. And for the latest Black Friday promotion, SaferVPN is offering an 80% discount with a brand new 3-year plan – $82.26 up front, or $2.29 per month on average for 36 months. Click here to get the SaferVPN Black Friday Coupon. PureVPN had a shaky start, but even so, there’s no denying that this VPN can compete with the big ones in the industry in features. Let’s find out what this VPN has in store for us, Black Friday style. A 1-month plan costs $10.95 every month. In the event that you choose to play a little risky and spare a couple of dollars, there’s the one-year membership plan that costs $64.95, or $5.41 per month. Their normal coupon gives a nice discount, the one-year membership costing a total of $35.88, or just $2.99 per month on average. You can save 88% by going to this page and getting a 5-year plan for just $1.32 per month on average, or $79.20 up-front. You end up saving $578! Now, that’s what we call a Black Friday sale. Click here to access the secret PureVPN Black Friday page. ExpressVPN is known for its top-notch security features. It’s also known for its higher-than-average priced packages, that is why we are so excited when we found about the ExpressVPN’s Black Friday deal. Normally, ExpressVPN is on the lofty side as a whole; when we take a gander at their 1-month subscription, it’s priced at $12.95 every month. Their yearly membership deal is $99.95, which turns out to $8.32 every month. The yearly membership deal grants savings of 35.8%. But lucky us for Black Friday, ExpressVPN offers an additional 3 months in their yearly subscription. It goes for $6.67 per month—$99.95 all in all for the first 15 months. Through this Black Friday and Cyber Monday, you get a 49% discount. Click here to get the ExpressVPN Black Friday/Cyber Monday Coupon (provided by ExpressVPN in their blog). NordVPN falls under the classification of what we would consider an “affordable” VPN, even without any coupons. The price becomes really attractive when we compare the wide range of features NordVPN provides compared to other VPN services in the market. This is the reason why a lot of VPN users invest in NordVPN. A two-year plan flies too fast when you use NordVPN. That is why we can rejoice when NordVPN offers an affordable 3-year plan for this month — it goes for $107.55 per year equating to $2.99 per month. The monthly subscription which normally costs $11.95, which adds up to $430.20 for 3 years should you wish to sign up for an ongoing subscription. NordVPN has a fantastic track record; they’ve been in the VPN game since 2012 and has been providing a trustworthy service ever since. We trust the development will be better and there’s no reason for us not to recommend you their 3-year plan. The premium performance, strong security, and affordability — what more can you ask for? 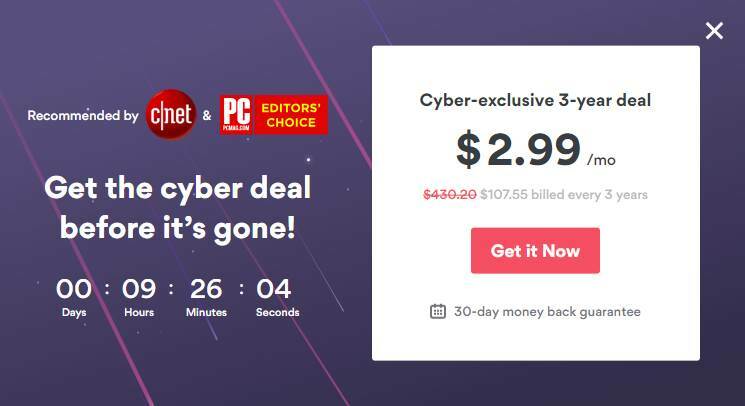 NordVPN passed the Trinity test with flying colors, so we say take advantage of this cyber deal which expires in a few hours. Jamie’s Note: It seems this countdown resets every day. We do not know how long this promotion will last, though. Click here to get the NordVPN Cyber Deal Coupon. This is yet another big fish in the VPN pond. CyberGhost is known for their vision of providing complete online anonymity to all its users. They have over 15 million users — all rejoicing over its exceptional product. CyberGhost offers a monthly subscription that goes for $12.99 every month, a premium cost with a premium service consider such this. With regards to the incentive for savings, they normally offer a yearly membership for $59.88, or $4.99 per month. For Black Friday, don’t miss out on their ground-breaking 3-year plan offer to $2.5 per month or a total of $89.90—that’s 81% off which is also fully refundable for 45 days. We don’t know about you, but we highly recommend you to grab this once in a lifetime opportunity. On top of the savings, CyberGhost just recently revamped their VPN. The all-new CyberGhost 7.0, for 7 years of data protected. Click here to get the CyberGhost Black Friday/Cyber Monday Coupon. ZoogVPN advertises to work in censored countries like UAE and Russia along with some essential features like Netflix, torrenting and no logs. A little bird told us they are also running a crazy Black Friday deal so we decided to share. With some crazy prices like $1.25, there’s little to lose. Click here to check ZoogVPN’s promotion. F-Secure’s Freedome VPN is another VPN we haven’t reviewed, but we heard through the grapevine that they’re having a nice promotion. Their plans are device-based for 1-year payments upfront. In other words, you have to pay more for more devices. The usual prices are 3 devices for $49.99 per year, 5 devices for $59.99 per year, and 7 devices for $79.99 per year. 3 devices for $24.99 per year, 5 devices for $29.99 per year, and 7 devices for $39.99 per year. All three plans are now on sale for 50% of their respective prices. That’s right, half off. They’re even running a sale for their other products as well (like their ad blocker, password manager, network protection, etc.). Check out F-Secure Freedome’s promotion (just use “BLACKFRIDAY” coupon code during checkout). Longer contracts are somewhat expensive but when you consider the tradeoffs, especially during these special promotional days, it is wise to sign up. This goes especially true for premium VPNs. If you know any other great offerings and holiday discounts, please let us know. Wow! Attractive deals by each company. 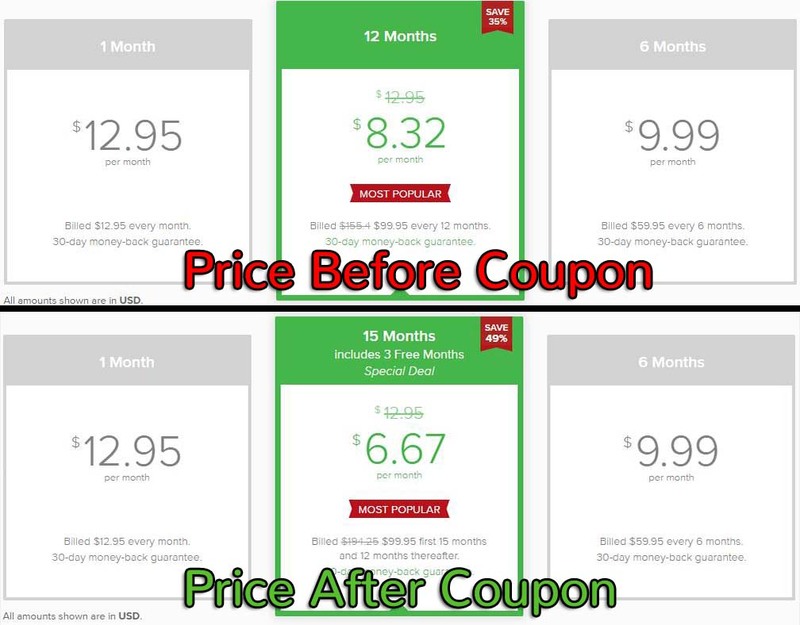 It makes me confuse which one to go for, cheapest one right now is PureVPN’s 5 year subscription for $79, that makes it around $1.32 a month, affordable much!